The reopening of swimming pools at the Isle of Man's National Sports Centre (NSC) will be delayed due to problems with installing new water slides. 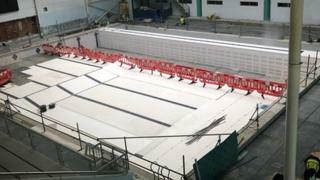 Both the competition and leisure pools in Douglas have been shut since August while a £4.2m renovation takes place. "Unforeseen structural works" must be carried out for the new flumes, said Sports Minister Graham Cregeen MHK. He said the three-week delay to the "complex project" was "disappointing". The pools will now reopen in mid-June. Other facilities at the centre have remained open during the renovation, which includes an overhaul of the pools and changing areas as well as replacement of the 20-year-old water slides. The NSC has the Isle of Man's only competition-standard pool. Isle of Man swimming coach Lee Holland said it has affected the national swimming team's training for this summer's Island Games, which take place on Gibraltar. He said: "There was never going to be a good time for us - it could have been a nightmare, but the other pools in the island have really helped us out." "It will now reopen a few weeks ahead of the Island Games, when the team has been selected. "It will look pretty for sure, but we can't wait to get using it." Mr Cregeen said the revamp was a "significant investment in one of the island's key sports facilities". "This is a complex project involving a significant number of contractors and suppliers, who are working closely with the department to deliver a high-quality, refurbished and enhanced swimming pool complex for the public."